Description: Very scarce Hood’s Excelsior Liniment with early hinge mold design. Embossed on (3) sunken panels. Winooski is located near Burlington on the Winooski River not far from the confluence with Lake Champlain – it was a very successful woolen mill town. American c. 1870. 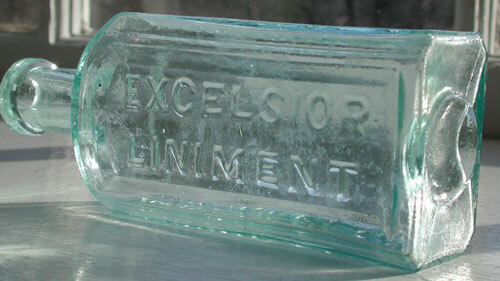 Embossed: A.O HOOD’S // EXCELSIOR LINIMENT // WINOOSKI, VT. Condition: Very good, some light spotty haze and a little roughness on the lip.